Well there is not much left to April, but I plan on getting some crafting done with the time that is remaining!! 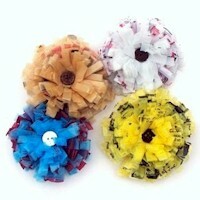 Since Earth Day is this month, I really want to do a craft involving recycled / upcycled materials. While crusing through the internet, I came across a cute tutorial for creating hair bows using plastic grocery bags. What a great way to upcycle all those grocery bags!! I cannot wait to try this one out! The other project on the to-do list for this month is a silk flower collage that I found on the JoAnns website. It looks like a super easy way to create beautiful wall art in a weekend! For now - I will leave my crafting goals at just 2 projects! What are your crafting goals this month?